Two days ago I almost hit bottom in the Unhappiness Department. You see, I went bra shopping. Now if you are a guy, you can just go away. Thank-you very much. Or at least scroll down two paragraphs. So I tried some retail therapy. But shopping for a simple T-shirt didn’t help. I think I tried on 25 T-shirts. I bought one. ONE! And then I bought a jacket to wear over the T-shirt, so no one would actually see me in the T-shirt. I will be fine this summer as long as the weather stays under 75 degrees, and I can wear my jacket. I don’t have a plan after that. Saturday we woke up early to head off to a baseball tournament. We had managed to pack up all the necessary gear for a day in the rain and sun. We had managed to read four short verses from the Bible before heading out. We had managed to collect four kids and their shoes into our mini-van. We managed some cold cereal for breakfast. And we managed to leave for the tournament almost on time. As we were pulling onto the freeway, the Hunni asked me for the directions (on my phone.) I couldn’t get to my phone right away as I was balancing a bowl of cereal that I was still eating, and a coffee cup. When I managed to get a free hand and pull my phone out of my purse, I discovered that I had five messages. Basically the five messages told me that the tournament had been moved, then postponed, and finally canceled. We headed for the next exit to go home. Suddenly we had a free day ahead of us. What should we do? We decided to start with a Bible reading of more than four verses, and an Ipod cast we listen to along with our Bible reading (J. Vernon McGee–Through The Bible). Everyone fell asleep except me. Even The Daddi fell asleep on the couch with his Little Boy in his lap. I made it all the way through, and I was wondering exactly how to profitably spend our free day. I was feeling rather proud of myself when the sleepiness wave hit. And it hit hard. So I started my Suddenly-Free-Saturday with a nap. 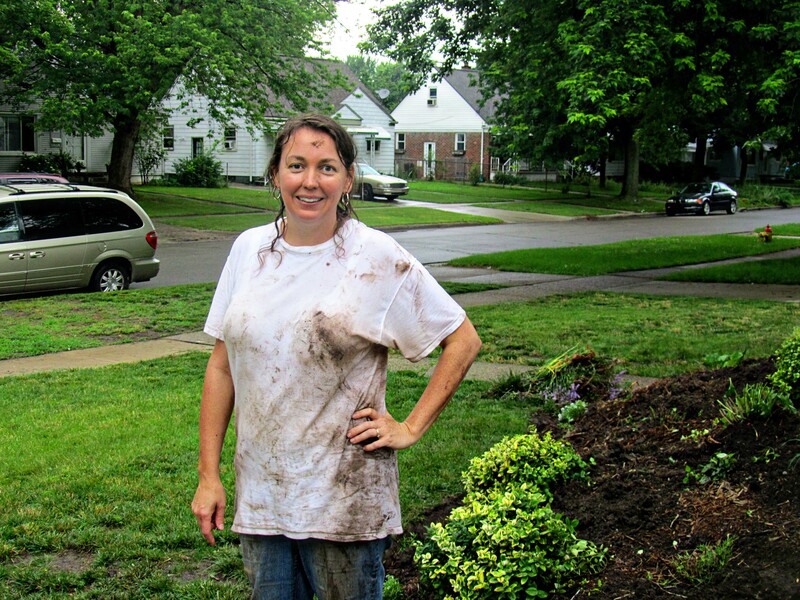 But when I woke up, I had double the energy, and I decided to tackle the yard. And yard work can take all those low feelings of no self worth and throw them out along with the yard waste. I do not know why hard work helps thoughts of ugliness, but it does. There was a slight drizzle all day, but I loved it. The kiddos got hungry around noon, but I kept digging and clipping. The Hunni reported that they had found some left-over pancakes from Friday night’s supper in the oven, so he continued his project. The drizzle turned into a rain, but still I loaded up the wheel barrow. And at 5:00, when I had finished, I was happy. And hungry. We had worked through lunch without even a glass of water. Why? Because we were having fun. The Hunni had a wood-working project, and I had a yard. A friend of mine had come by and offered to take the girls home for dinner at their place, so it was just the boys and me to feed. And I knew exactly what I wanted to cook. I had a frozen salmon slab. It isn’t really enough for our whole family, but with the girls gone, it would be perfect. And with it, we would have Rosemary Potatoes. The Rosemary Potatoes take longer than the salmon, so we started with them. Cube up some potatoes. Chop an onion or two, and them some fresh rosemary. 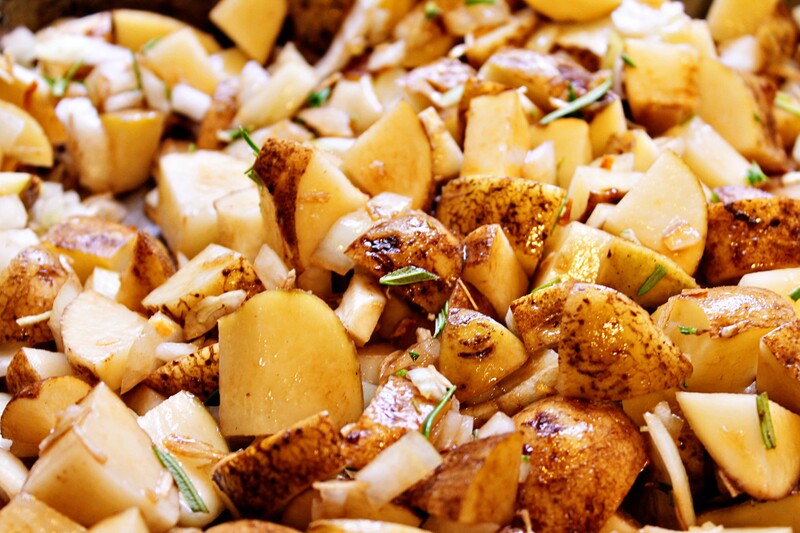 Drizzle the chopped potatoes and onions with olive oil, then add salt, pepper, and rosemary. Stir to coat, and then. . .
. . .roast in a 350 – 400° oven. 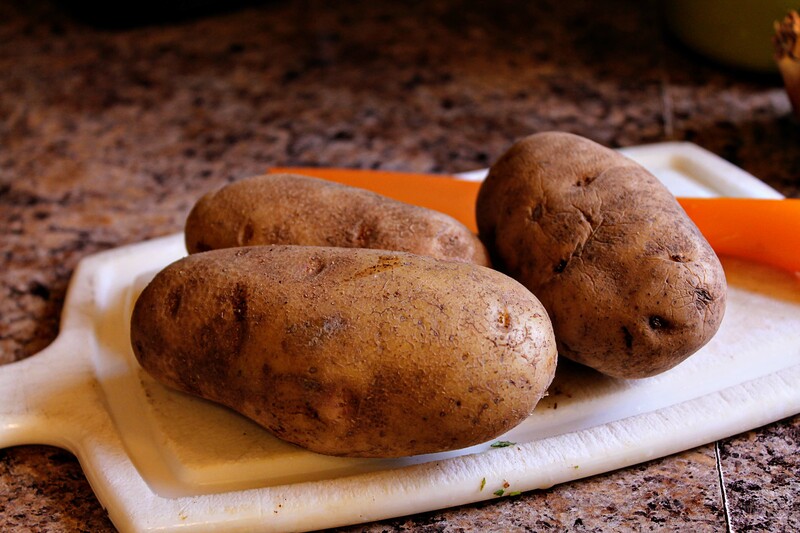 The time varies on the amount of potatoes you have. More potatoes equal more time. 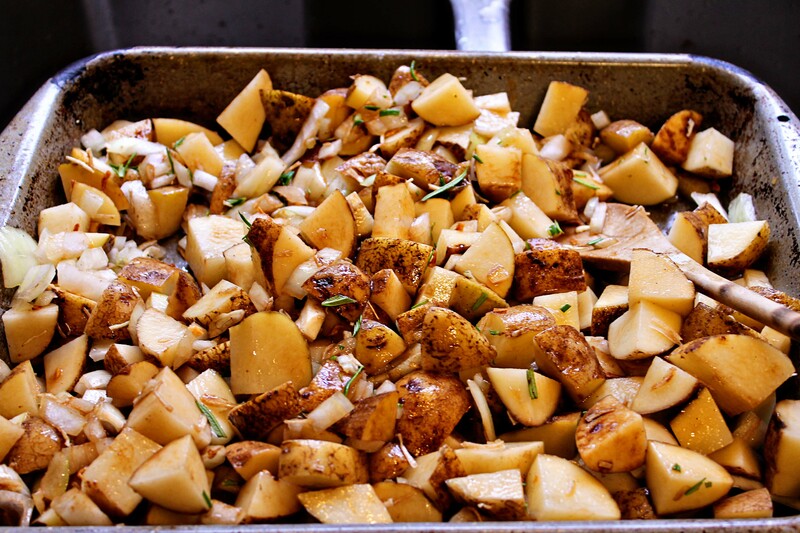 We also like our potatoes a little crispy, so we cook ours a little longer. About 30 – 45 minutes. I turn up the heat at the last to crisp up the potatoes. But first a story. 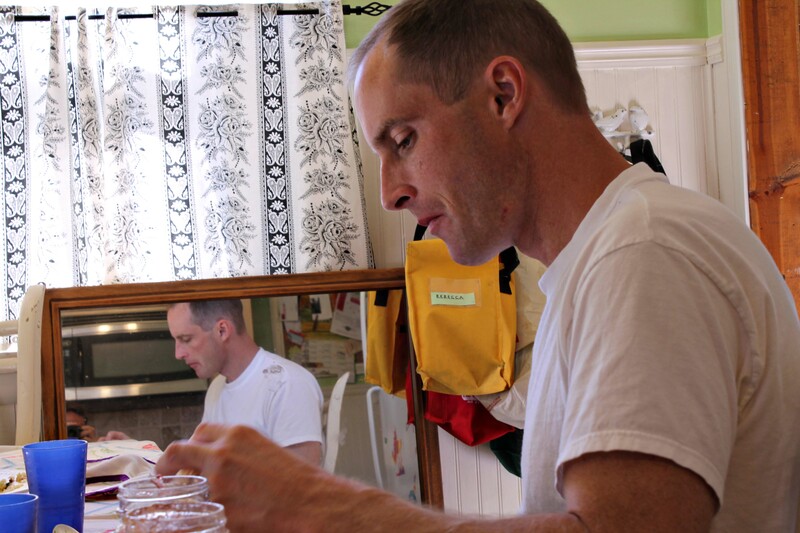 Right after I was married–like three weeks later–we ate dinner at my new in-law’s house. I was asked if I liked salmon. “Yes, I love it!”, I responded. “Good,” said my new mother-in-law, “I was thinking of having barbecued salmon.” “Do you like barbecued salmon?” she asked. Now in my mid-west mind when you say the words “barbecued”, it means slathered in barbecue sauce. I was horrified at the thought of having to swallow salmon drenched in barbecue sauce, so I promptly lied and said, “I love it!” (because I was a very new daughter-in-law and wanted to do the right thing.) I was surprised and thrilled when I was served grilled salmon with no barbecue sauce in sight. It turns out that grill vs. barbecue aren’t the only regional words. Joshua Katz from NC State University did his graduate project on the differences. He mapped 122 regional words, and his study went viral on the internet. Here is my favorite map. According to this map, I should say, “soda”, since I grew up in southern Illinois. But it just so happens that my mom is from New Orleans, Louisiana, so I always said, “coke.” Which word do you use? Other words included in the survey were crayon, route, pecan, lawyer, been, and several other terms like “addressing three or more people–you guys, you, you all, ya’ll” and the one they left out “you-ins”. But back to grilling salmon. I love it grilled on a cedar plank. Soak the cedar plank in water. I like to soak mine in a clean sink overnight, but you can do a quick soak if you are in a hurry. Put a heavy pot on top of the cedar plank as it floats. Grilled salmon is super easy. I love my Montreal Steak Seasoning mix. If you can’t find this mix (generic name is Canadian Steak Seasoning), here is a link. Isn’t she a beauty?! 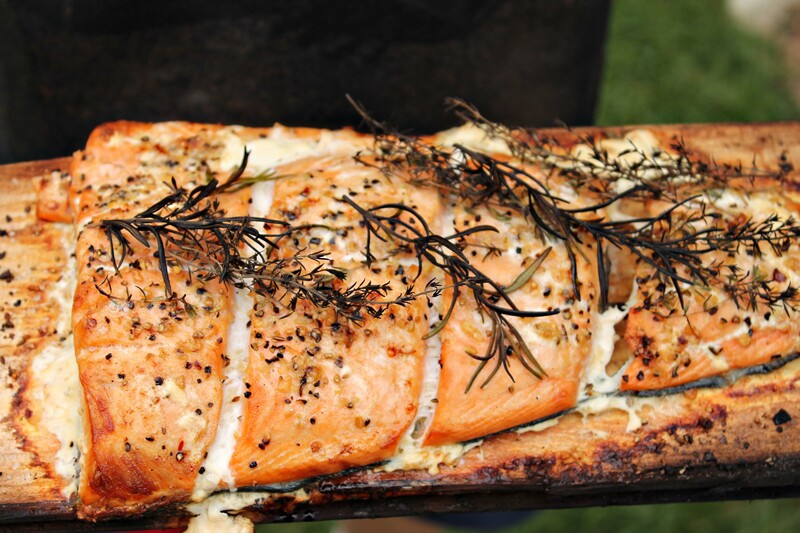 Just place the cedar plank right on the grill and the salmon right on the cedar plant. 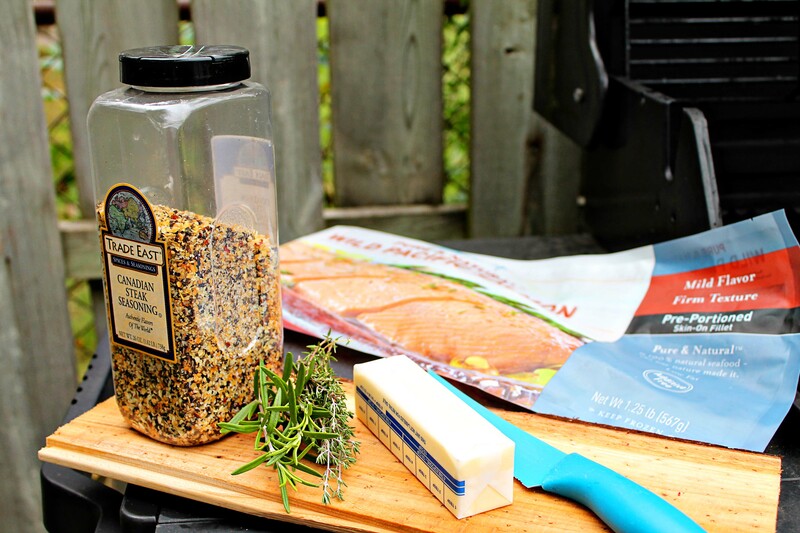 Hint: It is easier if you start the grill after placing the plank, salmon, and spices on. Sprinkle on the Montreal Steak Seasoning. Add some pats of butter. 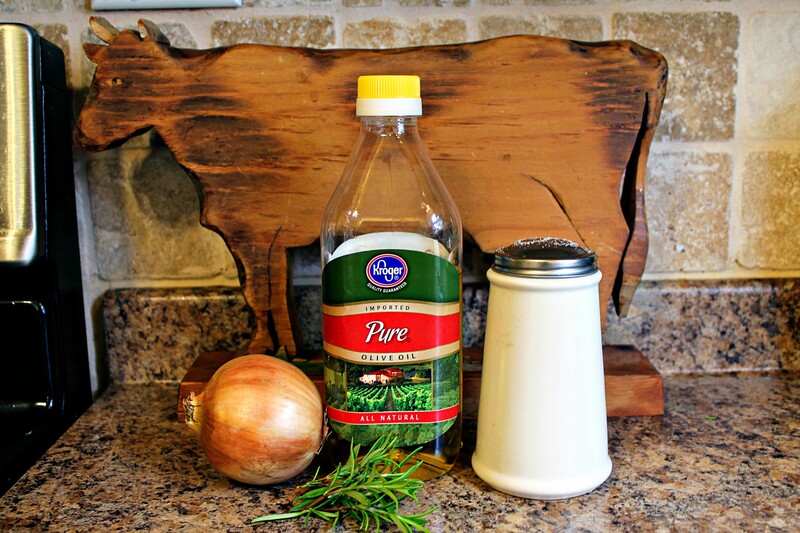 Lay on some fresh thyme and rosemary sprigs. Then close the lid. Salmon doesn’t take long to cook, but how long depends on how much salmon you have. I think we cooked this salmon for about 18 minutes. Salmon needs a fresh, green salad in my opinion, so use the 18 minute to make one. 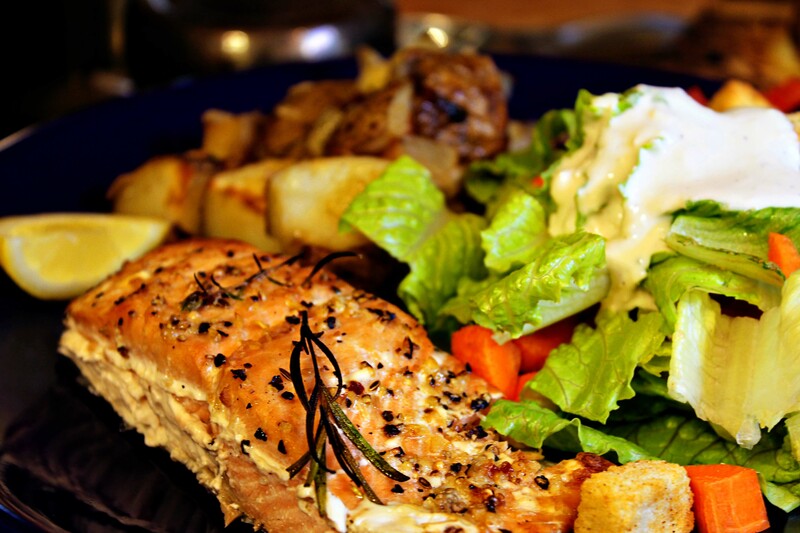 Dinner is served–Cedar Plank Salmon, Rosemary Potatoes, and Mixed Green Salad. Now for a few photos of the kiddos. 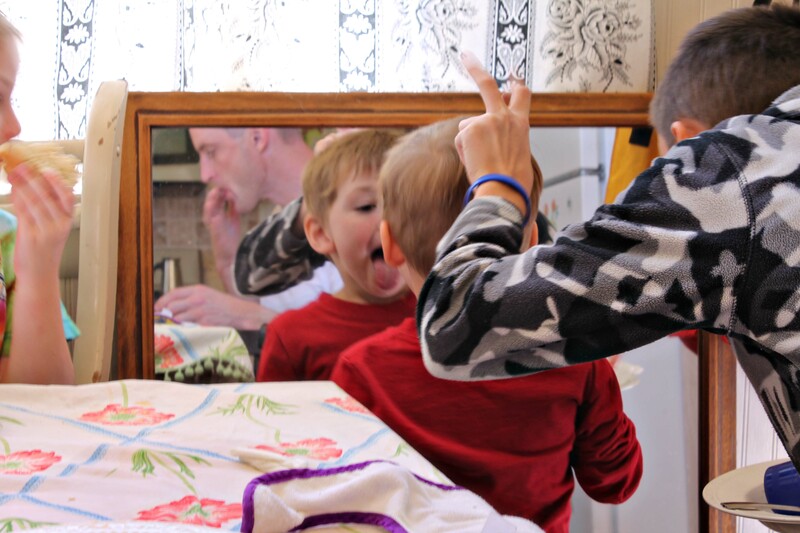 I took this mirror down to clean it, and Little Man stopped often to make faces. 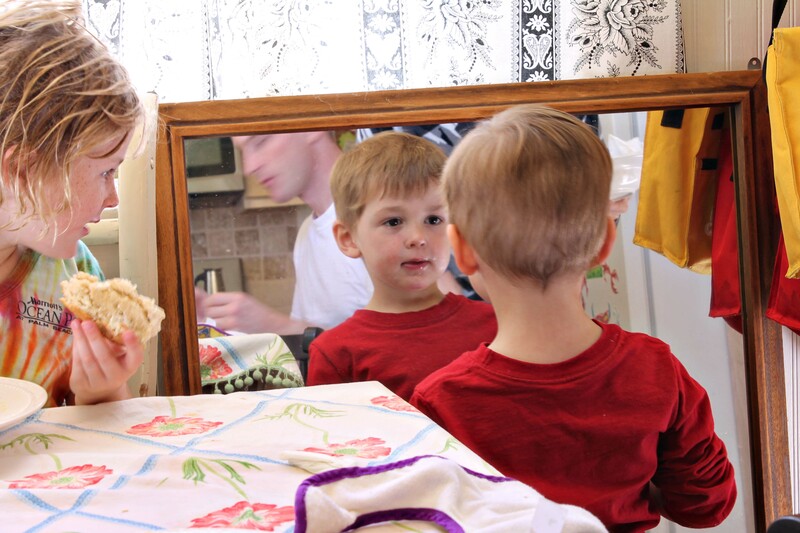 Baseball Boy enjoyed the mirror as well. And even I enjoyed my view in the mirror. So here is the question. Do you say soda, pop, soft drink, carbonated beverage, or coke? This entry was posted in Recipes and tagged Joshua katz, montreal steak seasoning, regional words. Bookmark the permalink. I sure would like to dig into this salmon dinner right now!! Yuuummmy!! 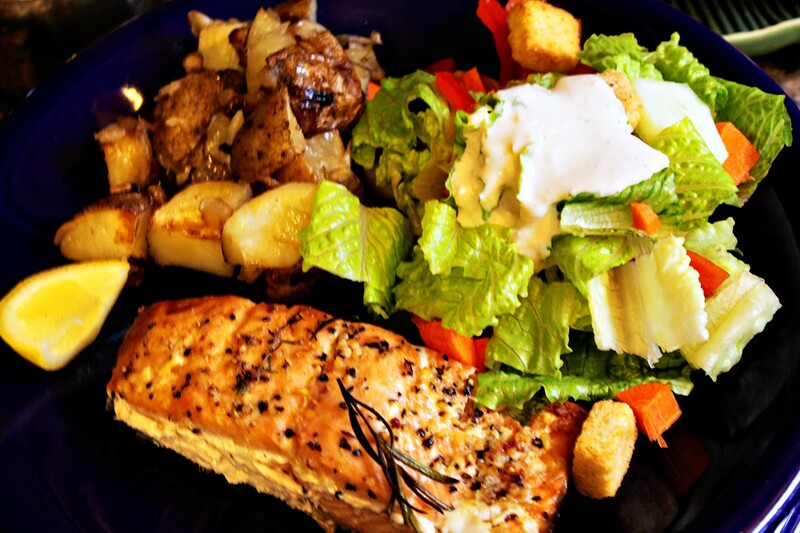 This is The Hunni’s favorite meal–grilled salmon. Reminds him of home I think. Your FIL says “NEVER use the term coke” because it is obviously the most inferior product. We say “Pop” and hope we are served “Pepsi”. Cute kids!!!!! Miss ’em. 🙂 Just got a call from Andy, and he said the wedding reception was really nice. Wish we could have been there. It was a ton of fun!! Wish you could have been here too. We missed you. BTW I think I’ll try that cedar plank on my next salmon. (If I can find one). Looks yummy! Pop….. Wow, what a good looking meal!! A northwest specialty for sure. I grew up saying “coke” but my husband thought it was weird when we (young people) would go out for a coke, then most of us would get a Dr. Pepper! 🙂 Now I say pop; I’ve lived longer in IL than I ever lived in Texas. I got to thinking about it, and I also say “soft drinks” when I ask someone to pick up something to drink. Like, “Could you get some soft drinks when you are at the grocery store?” I don’t think the map covered that word. pop, but friends said soda. always made me feel a bit weird, was probably the first word that i realized came in many flavors, and clued me in that we didn’t all talk the same. Superb salmon photos – I nearly got one of those planks but didnt think it work – over here we call it fizzy drinks and sometimes pop.